The EZ Drain above ground swimming pool cover is a great way to help you remove some of the pool water from the top of the pool during the winter season with out the use of a pump. 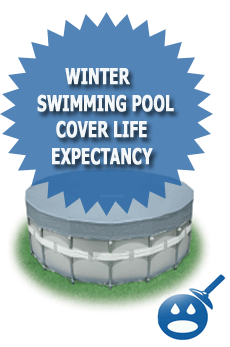 This type of cover is considered a specialty swimming pool cover so it will not install a like a basic pool cover. 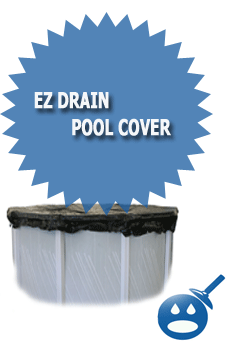 The EZ drain pool cover is not like any other pool cover because it has a drain installed in the center of the cover that connects to a hose so that your pool cover can drain automatically when rain or melted snow gathers on top of the cover. Installing The Island Recreational EZ Drain cover is not as hard as it may seem when you first open the box and see all the parts. The first thing you will want to do before attempting to install the EZ Drain is to make sure that you have all the parts that are supposed to be included. You can do this by comparing what you have with the parts list that came with the cover. You should have 2 clamps, a cone wall fitting that screws into your pool return, a cone fitting that will screw into the bottom of the pool drain in the center of the cover and also the drain hose that will attach from the center of the cover to the return fitting on the swimming pool wall. Now that you are sure that you have all of the parts to install your EZ Drain pool cover you can consider yourself ready to install the cover onto your swimming pool. The first thing you will want to do is to take the two cone fittings and set them aside. The first cone fitting will screw into the bottom of the drain that is in the center of the cover. You will first want to wrap the fitting with Teflon tape and then screw it into the bottom of the EZ drain that is located in the center of the pool cover. You know will want to walk over to your wall and remove your return jet fitting. The second cone fitting will screw into the return fitting on the pool wall once you have removed the pool return jet eyeball. Once you have both of the cone fittings installed you can now take one end of the drain hose and slip it onto the cone fitting and tighten it down with your hose clamp. Now you can have some one help you and slide the EZ Drain Pool Cover onto the top of the pool but at the same time you want to make sure that you hold on to the other end of that drain hose so you can connect it to the return wall fitting. Once you get the cover into place you then can connect the other end of the hose to the cone fitting that you screwed into the wall fitting. So you should have one end of the hose connected to the center of the EZ Drain and then other end of the hose should be connected to the return wall fitting. The one thing you will want to make sure is that you have no slack or the drain hose is not sagging into the pool water after the hose is connected and the cover is in proper position. If you have a sagging or hose that is drooping into the pool water the cover will not drain. You will need to make sure that the hose is almost in a downward angle toward the return fitting so the water can use gravity to drain the pool cover. Once you have adjusted the hose and the pool cover is centered you then can put the wire cable through the eyelets on the out part of the cover and then tighten the cable down with your cable winch. Your EZ Drain Pool Cover is now installed. The one thing that you will want to watch for is to make sure to keep all leaves and debris off the top of the mesh drain so the cover can drain all because sometimes these things can clog the drain in the center of the swimming pool cover. Hi I have had the ezdrain cover for years now,love the way it works,but this year I bought a new ezdrain cover and put it on,water is coming out of the hose and there’s no water on the cover.This has never happened before,I know the cover is working cause it rained the other night and the drain did drain the water.What can the problem be,I am very frustrated. Its not my first time to go to see this site, i am visiting this web site dailly and take nice information from here everyday. « Why Is My Pool Water Green?